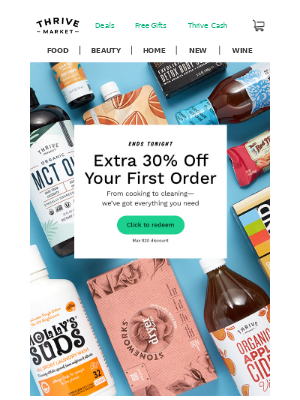 Thrive Market Ends Tonight: Extra 30% Off Your First Order. From cooking to cleaning we've got everything you need. Click to redeem. Max $20 discount. Bonus! You also have the option to pick a FREE gift with every order! Just stop by the Deals page to select the one you'd like most. See the choices. Healthy buys for every household Pantry Staples Wellness Essentials Eco-Friendly Home Self-Care You May Also Like These Cordyceps & Chaga Mushroom Coffee Mix Four Sigmatic Cordyceps & Chaga Mushroom Coffee Mix Organic Raw Unstrained Honey Thrive Market Organic Raw Unstrained Honey Shop Now Shop Now Lion's Mane & Chaga Mushroom Coffee Mix Four Sigmatic Lion's Mane & Chaga Mushroom Coffee Mix Organic Tahini Thrive Market Organic Tahini Shop Now Shop Now Popular on Thrive Notebook Mini-Bagels Recipe Mini-Bagels Recipe Make it Healthy Valentine's Day Menu Ideas Healthy Valentine's Day Menu Ideas Learn more Shop by Value Paleo Gluten-Free Vegan Ketogenic Organic Raw Shop Recommended Brands Simple Mills Aztec Secret NUCO Nutrex Hawaii Banza Desert Essence Pantry in your pocket: Download the Thrive Market app download the Thrive Market app download the Thrive Market app instagram facebook twitter pinterest youtube google plus 24/7 Chat | FAQ | Contact Us | Read Our Blog We don't want to see you go, but if you no longer wish to receive promotional emails from us, you can unsubscribe here. Can't see this email? View Online 4509 Glencoe Ave, Marina Del Rey, CA ©2019 Thrive Market All Rights Reserved 30% off offer expires 2/9/19 at 11:59 PM PT. Valid for new (first-time) customers only. Click through this email to redeem. Maximum discount of $20 applies. One use per customer. Limit one promotional code per order. Offer not valid on Thrive Market gift cards and Nordic Naturals branded products. First purchase enrolls you into Thrive Market 30-day trial membership. Free gift: A minimum merchandise purchase may be required (excluding taxes and shipping fees). One gift per customer per order. Gift cards, frozen meat and seafood, and wine boxes cannot be used towards minimum order value. Cannot be combined with other gift with purchase promotions. Please visit https://thrivemarket.com/terms for complete Terms of Service.